As I lay on the ground, my tormentors swarming around me, a voice emerged from my chest. It sounded like my voice, but it wasn't a thought of mine. I didn't say it. The voice that sounded like my voice, but wasn't, said, "Pray to God." I remember thinking, "Why? What a stupid idea. That doesn't work. What a cop-out . . ."
That voice said it again, "Pray to God!" It was more definite this time. I wasn't sure what to do. Praying, for me as a child, had been something I had watched adults doing. It was something fancy and had to be done just so. I tried to remember prayers from my childhood experiences in Sunday school. Prayer was something you memorized. What could I remember from so long ago? Tentatively, I murmured a line, which was a jumble from the Twenty-third Psalm, "The Star-Spangled Banner," the Lord's Prayer, the Pledge of Allegiance, and "God Bless America," and whatever other churchly sounding phrases came to mind. "Yea, though I walk in the valley of the shadow of death, I will fear no evil, for thou art with me. For purple mountain majesty, mine eyes have seen the glory of the coming of the Lord. Deliver us from evil. One nation under God. God Bless America." To my amazement, the cruel, merciless beings tearing the life out of me were incited to rage by my ragged prayer. It was as if I were throwing boiling oil on them. They screamed at me, "There is no God! Who do you think you're talking to? Nobody can hear you! Now we are really going to hurt you." They spoke in the most obscene language, worse than any blasphemy said on earth. But at the same time, they were backing away. In the thirty years since Raymond Moody's Life After Life appeared, a familiar pattern of NDEs has emerged: suddenly floating over one's own body, usually in a hospital setting, then a sudden hurtling through a tunnel of light toward a presence of love. Not so in Howard Storm's case. Storm, an avowed atheist, was awaiting emergency surgery when he realized that he was at death's door. Storm found himself out of his own body, looking down on the hospital room scene below. Next, rather than going "toward the light," he found himself being torturously dragged to excruciating realms of darkness and death, where he was physically assaulted by monstrous beings of evil. His description of his pure terror and torture is unnerving in its utter originality and convincing detail. Finally, drawn away from death and transported to the realm of heaven, Storm met angelic beings as well as the God of Creation. 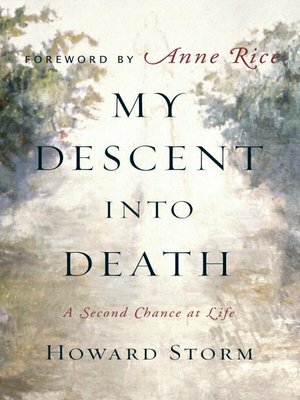 In this fascinating account, Storm tells of his "life review," his conversation with God, even answers to age-old questions such as why the Holocaust was allowed to take place. Storm was sent back to his body with a new knowledge of the purpose of life here on earth. This book is his message of hope. HOWARD STORM was a studio art professor at Northern Kentucky University for more than twenty years. Today he is an ordained minister and pastor of Zion United Church of Christ in Cincinnati, Ohio.